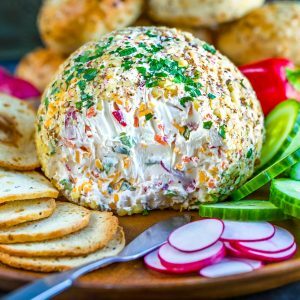 A super fun way to serve bagels and cream cheese, this Veggie Cream Cheese Breakfast Cheese Ball will jazz up your brunch game with little effort! This tasty veggie-packed cream cheese can be made the night before for a make-your-own-bagel spread for family and friends! If vanity plates didn’t make me twitchy, my license plate would surely read OMGBAGELS and, in a perfect world, my kitchen would be stocked with an assortment of soft and chewy circle carbs at all times. Anywho! I decided it was very well time to share my infamous veggie cream cheese spread. Also because I wanted a crazy easy brunch option for the holidays that didn’t involve me being stuck in the kitchen all morning while everyone opens gifts without me. I’ve wasted way too many holidays shackled to the kitchen to know that this make-your-0wn-bagel spread is where it’s at! And with a cream cheese veggie cheese ball as the centerpiece, it’ll feel all festive and fancy when you bring out a tray of bagels with all the fixings and tell everyone to make their own dang breakfast. They’ll be so excited over the ball-shaped cream cheese spread they won’t even realize you tricked them into doing all the legwork. So grab a piping hot cup of coffee, slather your bagel in this delicious veggie cream cheese, and kick your feet up. You deserve it! 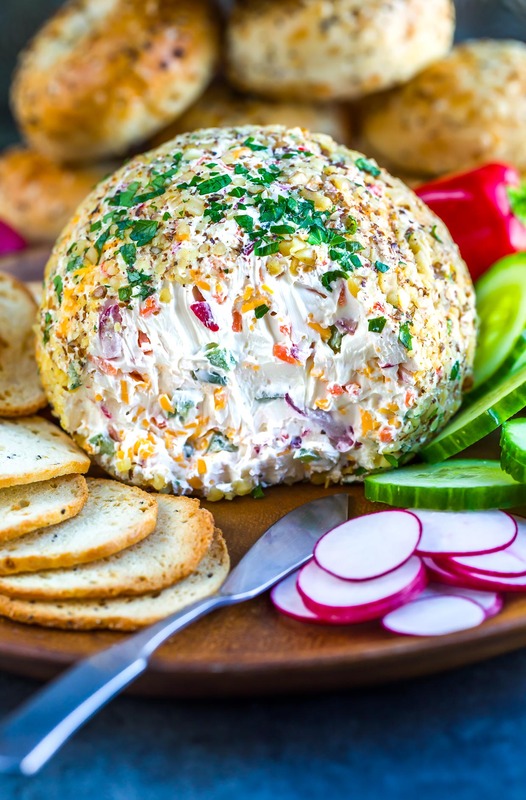 Serve up bagels in style with this brunchtastic cheese ball. With the spread as the centerpiece, add all your favorite bagel toppings and extras along with an assortment of bagels and bagel chips. Need a few topping ideas for your bagel bar? Ready… Set… BAGEL AND CREAM CHEESE BALL! 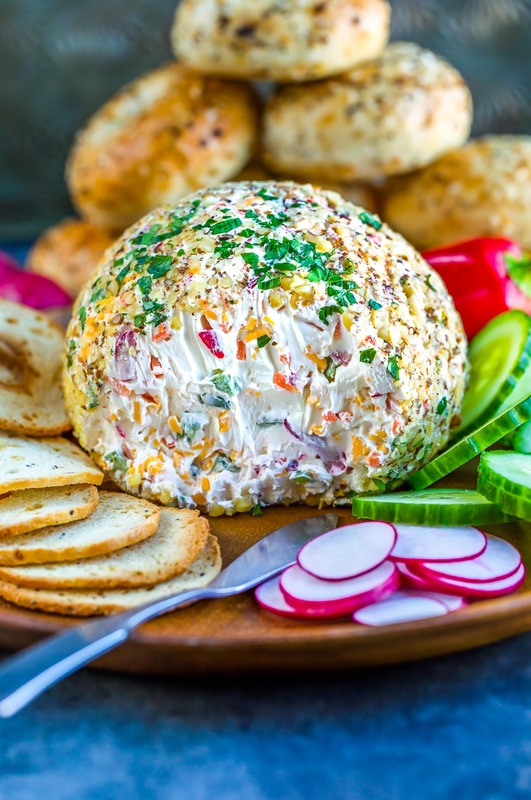 Celery +/or red onion also make excellent mix-ins for this veggie-studded cream cheese ball. Allow cream cheese to soften slightly. While you let it sit, chop your veggies and crush your walnuts. For ingredients like cheddar cheese, shredded carrot, and shredded radish, you can use the coarse side of a cheese grater to create shreds. I like to chop mine into small pieces after shredding for a confetti-like effect in the cheese ball. Add cream cheese to a large bowl and use a hand mixer to whip for about a minute. Add all your veggies, cheddar cheese (optional), salt and garlic powder and blend until veggies are dispersed throughout the cream cheese, approx. 30 seconds or so. Spoon cream cheese onto a sheet of plastic wrap and form into a ball. Pop in it the fridge for a few minutes to set, if needed, then remove the plastic and roll in crushed walnuts and parsley. If making in advance, add cheese ball to bowl or plate and cover tightly. Allow ball to soften a little at room temperature before serving for easy spreading. Serve with bagel chips, bagels, assorted fresh fruit, veggies, and all your brunch essentials. Enjoy! See post for bagel topping ideas for a custom brunch platter that'll rock your socks! Serve with bagels, bagel chips assorted fruit, veggies, and all your brunch essentials. Check out this Everything Bagel Grilled Cheese Breakfast Sandwich or try our super fluffy Everything Bagel Biscuits! What fun! And it would be exquisite with smoked salmon! Ohmygosh yes – perfect combo!